The set of software for the SkyLark SL NEO platform contains the instrument Easy Muxer that allows the user to implement multiplexing and demultiplexing the DVB-ASI/IP transport streams. Easy Muxer software is functioning autonomously and independently from SL NEO server software. Insert of commercials, or programs of local broadcasting into the DVB-multiplex received through the IP/ASI-interfaces, requires demultiplexing (dividing into separate programs) the input MPTS stream. 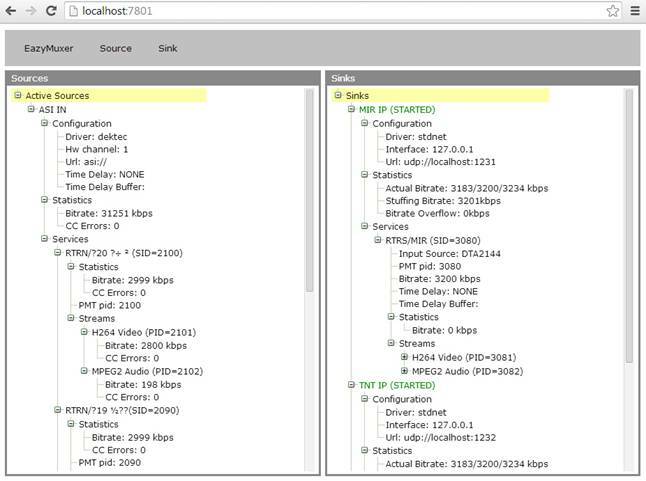 After processing by Easy Muxer software, separate programs (SPTS transport streams) that have UDP Multicast/Unicast protocols, can be redirected to SL NEO server software through the IP interfaces for further processing (for example, commercial inserts). 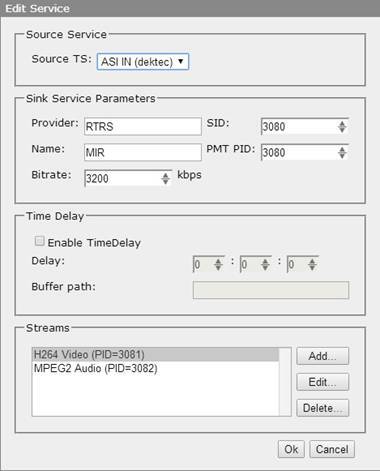 At the end of the insert process, you can use Easy Muxer software for the reverse procedure of multiplexing the SPTS streams into MPTS, using the ASI or IP transport. Support of remultiplexing the transport streams isn't included to the set of SL NEO product line as a basic function: you need activation for work of Easy Muxer. Without the license key Easy Muxer works 72 hours. As an example, let's consider the algorithm of configuring Easy Muxer software for demultiplexing the DVB-ASI MPTS input stream into one-program UDP IP SPTS transport streams. The DVB-ASI (Asynchronous Serial Interface) interface has the maximal bandwidth 270 Mbps, which allows sending several MPEG-2/H.264 programs with different speeds within one multiplex. The total bitrate of all programs may not be higher than 200 Mbps, the transfer rate of one program is, as a rule, from three (SD) to fifteen (HD) Mbps. Easy Muxer is installed in a set of SL NEO server and client software, the launching icon of Easy Muxer is placed at the Windows desktop. After launching, the icon showing the activity of the application, appears in the Windows tray. By the right click on the icon you can launch Administrator Control Panel - the web-console for adjusting Easy Muxer. For remote work with the console you should use the web-browser (it's desirable to use Google Chrome). 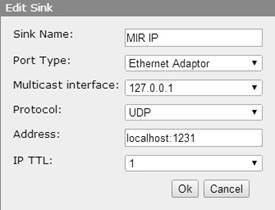 You can activate the console from any machine in the network by the address http://server_ip:7801. The default value Password is the blank field. The interface contains Top-menu and two main windows: Sources that displays the parameters of the received stream and the basic parameters of the contained programs, and Sinks - the window placed at the right part of the interface, displaying the current status and parameters of all the output programs and streams. The section of the Top-menu Easy Muxer displays the number of the current version of SL NEO software and the current license status for Easy Muxer. The section also contains the initial information that may be requested by the producer (Skylark Technology) for generation of the license key: Machine Code, the total number of I/O streams. In this section you can set the password for the login to the Easy Muxer control web-console. Source - the Top-menu section for adjusting the input interfaces and transport streams, Sink - the section that allows users to adjust the output parameters. Choose the Top-menu section Source, find the item New Source. Select the field Source Name in the opened window and enter the random source name. For capturing streams that are sent through the ASI-interfaces, the SL NEO platform supports boards produced by DekTec: find the list in the field Port Type and choose Dektec DTA...ASI - the Dektec DTA series board (the platform supports the following models of boards: DTA-105, 124, 145, 160, 2144, 2145; the corresponding board should be present in the system). In the field Port Number specify the number of the physical port of the board, which receives the stream. 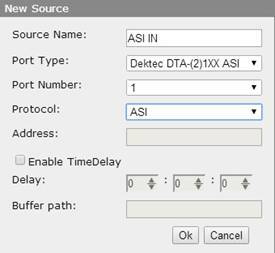 The item Enable Time Delay allows users to record the input stream to the drive "as is" and, thereby, implement the time shift for a certain time. You should enter in the field Delay the maximal time that you need for the delay of the input stream, in the field Buffer Path specify the path to the disk for recording the stream. After the end of configuring, the window Sources will display the current information about the received stream and the contained programs, including the appropriate SID and PID identifiers. Choose the Top-menu section Sink and find the item New Sink. Select the field Sink Name in the opened window and enter the random name for the output interface. In the field Port Type choose Ethernet Adaptor from the list. For generating multicast IP-traffic, you should select the field Multicast Interface and enter the physical IP-address of the network adapter of the server that will form the multicast-stream. Choose UDP (the basic protocol for sending the stream video and audio) from the field Protocol. For generation of unicast IP-traffic, enter in the field Address the IP address and port of the machine that will receive the stream. For generating multicast IP-traffic, enter in the field Address the IP address from the range 224.0.0.0 - 239.255.255.255 and the port. The parameter IP TTL - Time To Live (the batch lifespan) means the number of routers that the batch can pass through (the batches with TTL=1 are transmitted only within one subnetwork). For forming several SPTS-streams, you should adjust the corresponding number of output interfaces (Sink) - one for each stream, the numbers in the field Address should differ, if the IP values are the same. Choose the Top-menu section Sink and find the item New Service. In the opened window Add Service, choose from the list one of the previously configured output interfaces (Sink), which will be bound to the given service and will be responsible for forming the SPTS-stream. Open the window Source Service and choose the stream source from the field Source TS (ASI IN in our example). In the window Sink Service Parameters specify the main parameters of the formed stream: the provider name, program title, basic identifiers of the program - SID и PMT PID. Set the maximal speed of the formed stream in the field Bitrate. You can see the current speed value for the particular program in the window Sources, which displays data for all the received programs. In the window Streams you should implement connection to video and audio data of the input stream: By the button Add in the opened window specify the identifier (PID) of the source of video-data, in the window Stream Parameters find the field PID and set the identifier of the source of video-data for the output program. In the field Stream Type you should choose an algorithm of compression from the list - the same, as the algorithm of the source. All necessary information for setting the values is displayed in the window Sources, at the main part of the Easy Muxer interface. After configuring the video parameters, you should implement similar adjustments for the audio-data. The window Time delay allows setting the value for the time shift when forming the stream (an appropriate option should be activated in the settings of the input stream). 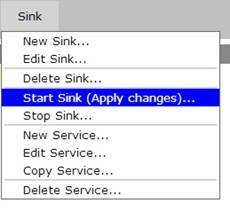 To save the adjustments and launch the service, you should choose the command Start Sink in the Top-menu section Sink of the application. The easiest way of configuring the big number of services is copying settings, including all the descriptors, from the initial service. To do this, you should use the menu items Copy Sink and Copy Service. Finish the work of Easy Muxer, enter the folder C:\Program Files (x86)\SL NEO Media Platform\run (for 64-bit Windows) or C:\Program Files\SL NEO Media Platform\run (for 32-bit Windows) and copy the file tsremux_config.xml, which contains the information about the current Easy Muxer configuration. You should also copy the file with the extension lic - this is the file with the license key. Restoring settings is implemented when Easy Muxer software is stopped, by changing the file tsremux_config.xml in the folder C:\Program Files (x86)\SL NEO Media Platform\run to the previously saved copy.